The science of tennis technique is explained in this guide that practically applies the lessons learned from studying the forces and motions of tennis strokes. Through the implementation of six basic biomechanical principles players can make subtle adjustments to their strokes, creating stroke variations that not only improve their game but also reduce their risk of injury. Detailed line drawings; stroke analysis and sequence photos of top touring pros; action photographs and high-speed video images; and an exploration of the benefits of video replay provide players with a variety of useful techniques. Duane Knudson, PhD, is a professor in the department of kinesiology and an associate dean of the College of Communication and Education at California State University–Chico. 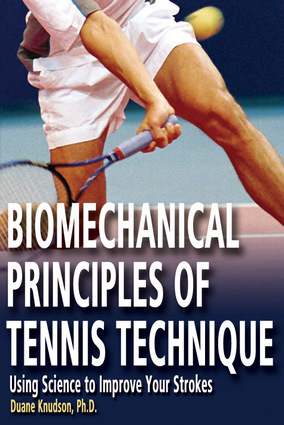 A world-renowned expert on the biomechanics of tennis, stretching, and qualitative analysis, he has served several terms on the Sport Science Committee of the United States Tennis Association. He is a fellow of the American College of Sports Medicine and the American Alliance for Health, Physical Education, Recreation, and Dance (AAHPERD), and the author of Fundamentals of Biomechanics. He lives in Chico, California.